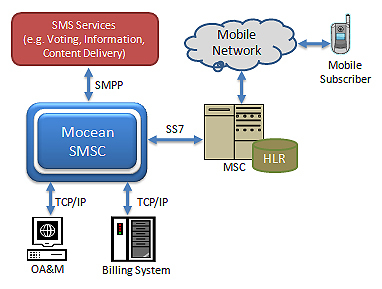 Mocean SMSC has SS7 and SIGTRAN interface support, ready to be implemented in any GSM network immediately. Protocol stacks supported includes MAP (ETSI Document TS 100 974 v7.11.0 or 3GPP TS 29.002), TCAP ITU-T (Q771–775), SCCP (ITU-T Q.711-Q.719), M2PA (IETF RFC 4165), M3UA (IETF RFC 4666) & SUA (IETF RFC 3868). Mocean SMSC support Short Message Peer-to-Peer Protocol (SMPP). This allows Mobile Operators to easily create SMS based services (e.g. Competition Voting, Information Services and Notification Services) or open up service creation to Content Providers. Additional revenue streams can be generated with such services. Other TCP/IP client-server protocol support can easily be added into the platform. Mocean SMSC comes equipped with reporting functions that allows the Mobile Operator to have a overall view of the SMS traffic transactions going through the system. Operators can then optimise their network capacity planning activities. Mocean SMSC comes with easy to use GUI to allow the operations team to easily manage the system. This provides shorter learning curve and more importantly, lowering possibility of human errors. As the GUI is web based, it also makes it easier for the operations team to access it anywhere over a secure connection. Mocean SMSC allows Mobile Operators to have better control over the SMS traffic going through its network with Message Filtering mechanisms. SMS messages can be filtered based on different criteria such as message contents, sender identification or receiver identification. The system captures transaction details and is able to send the Message Details Record to the Mobile Operator’s billing system for further processing. Optionally, if customised integration to the billing system is required, this can be done.